These Cool House Ideas Are Simple and Awesome! We’ve found some pretty cool house ideas we’d like to share with you today. From storage solutions to repurposing items…and even a little security tip…you’re going to love at least one idea and maybe even all 5! All are affordable and most can even be a DIY project. The best part is that they’ll all add a little extra something special to your home. So, let’s dive in, shall we? Unless you live in a mansion, you can probably make use of a little extra floor space in your living room or your family room, right? Or maybe you’re just not with doing living spaces the same way that your parents, your grandparents and their parents did! 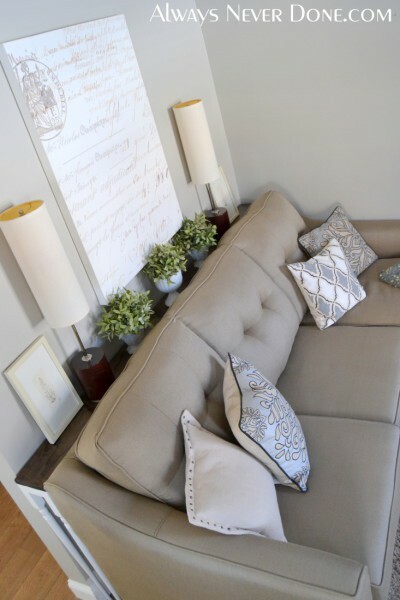 That’s why we love the idea of a small coffee table behind the sofa. Not exactly a new creation (they’ve been around forever), but definitely a cool house idea for anyone low on space or just looking to ditch tradition and do a new thing! Wine Racks In the Bathroom? Yes! We love cool house ideas that find new purposes for everyday items. 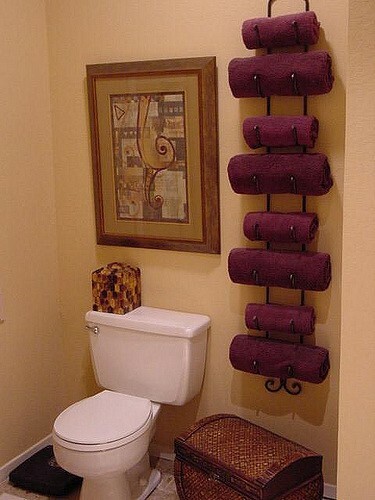 Here, you can use an ordinary wine rack to store and display your bathroom linens.